Selection from the cover of new FEMA report urging more private-sector disaster response. The Federal Emergency Management Agency (FEMA) report released late Thursday is making headlines by taking responsibility for how the agency failed Puerto Rico in its response to Hurricane Maria. 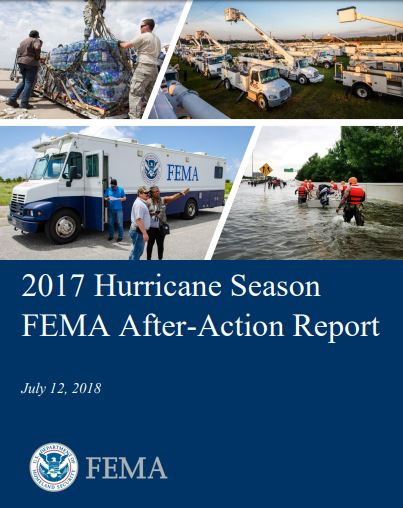 The 2017 after-action report on the 2017 hurricane season concludes that FEMA failed to anticipate several problems it would face in the event of a catastrophic storm coming quickly on the heels of other natural disasters. Although the report refers to the “exceptionally active” season of 17 named storms, it does not refer to climate change or recommend measures to fight or mitigate it. In addition, the report does not contemplate increased funding for FEMA, which might alleviate many of the problems it identifies. Instead, the solutions FEMA envisions come largely from FEMA outsourcing its role to local governments and to private business. Although the report cites Puerto Rico’s financial woes, it does not address how other local governments might fund disaster preparedness, let alone recommend tax or other revenue increases to do so—even though lack of disaster preparedness historically proves much more expensive. Although the report outlines ways the government can improve and streamline its own performance, it lays the fault for private-sector shortcomings also at the government’s feet. The report notes that $3 billion was committed over 1464 contracts during a three-month period during and after Maria—compared to an average of $1.3 billion annually beforehand. The vast increase in reliance on the private sector, however, is never connected to the shortcomings in the response. When the report does address private-sector failings, the blame is placed on government. In one example cited by the report, “shipping containers often arrived in Puerto Rico labeled simply as ‘disaster supplies’,” forcing relief workers to spend time to unpack and inventory the containers. The fault for this is placed on FEMA for not requiring the company to upload more precise shipment information. contractors, the report’s solution is to, “Increase transportation planning, management, and contract support capacities.” In other words, hire more FEMA workers not to manage emergencies, but to manage private-sector contracts for emergencies. Increased spending is justified in at least one section of the report. Rents for emergency housing were authorized at 200% above fair market value in Puerto Rico. And at 300% above fair market value in the Florida Keys.